WVU's School of Public Health was awarded funding to develop a new residency program focused on public health. To help combat the region’s ongoing health issues, the West Virginia University School of Public Health is developing a new residency program focused on public health, the first of its kind in Appalachia. The School was recently awarded funding by the U.S. Department of Health and Human Services, Health Resources and Services Administration, one of only 17 such awards in the country, to establish a new Public Health and General Preventive Medicine residency and expand the existing Occupational Medicine residency. Both two-year programs are the only preventive medicine residencies in the Appalachian region and are aimed at training physicians skilled in public and occupational health who are committed to serving rural and underserved populations across Appalachia. Even though Appalachia is disproportionately affected by numerous public health issues, there are far fewer preventive medicine specialists here compared to the rest of the country. 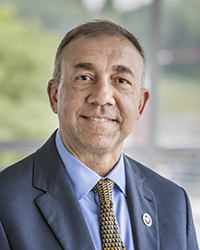 There are currently only two board-certified Public Health specialists in active practice in West Virginia, including WVU School of Public Health’s Assistant Dean for Practice and Service Dr. Michael Brumage, who will serve as Program Director of the new residency. Residents in the new program will participate in both academic and practical/clinical activities. The first year will focus on satisfying requirements for the Master of Public Health degree and participation in the Occupational Medicine clinic and other clinical rotations. During the second year, residents will be based with a local or regional health department where they will gain experience in typical public health department and clinical services, primary care and mental health care services. The School’s Division of Occupational Medicine was founded in 1988 through a grant from the CDC’s National Institute for Occupational Safety and Health and has grown into one of the largest academic-based Occupational Medicine clinics in the country attracting physicians from across the country and around the world for training. Through the School’s long-time partnership with NIOSH Morgantown, residents have opportunities for national-level field investigations and research. Largely due to the presence of this program, there are currently 14 board-certified Occupational Medicine specialists in the state. “We are confident we can replicate the success of our Occupational Medicine program through this new Public Health residency and greatly increase the number of specialists in Appalachia to address the needs of our region,” Martin said. The School plans to submit an application for accreditation of the new program this summer and admit its first resident in July 2019. The award will provide support for one new resident in each year in the Public Health program and double the number of residents currently in the Occupational Medicine program to a total of four.